Here we are, with Remo, Egidio and Sandro. We are at the Latteria Sociale dairy cooperative in Roverbella, in the Province of Mantua, right on the border between the Lombardy and Veneto regions. In 1955, around a hundred farmers decided to set up this cooperative to collect the milk from their cows in order to produce Grana Padano. Over the years, the number of members has gone down and today there are only 12 farmers, mainly located in Roverbella; only a few are based outside the municipality but still only a few kilometres away. There are fewer farmers but at the same time, the quantity of milk has increased considerably. In the past, the milk was collected in churns and in the summer they were immersed in cold water to keep the milk cool. With the introduction of the refrigerated milk truck, things have changed a good deal and the quality has certainly improved. Remo is the president and he is keen to point out that the dairy is still very "artisanal". There are still tanks for skimming the milk, and technology only helps the cheesemaker up to a point. He still is responsible for the quality of the cheese, as he carefully assesses the milk being delivered, decides how much cream to keep and what the right cooking temperature should be, plus all kinds of other things. 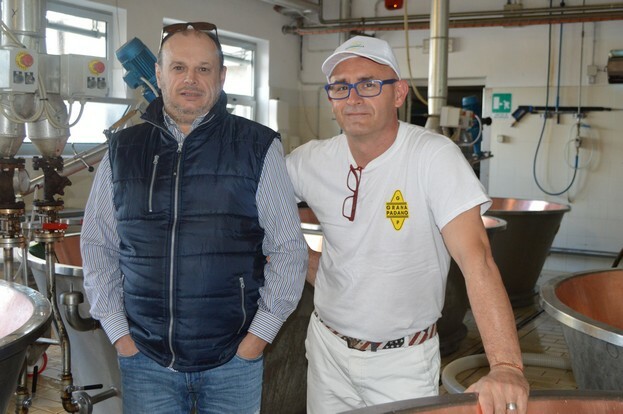 Sandro, the cheesemaker, has been working and living here since 2005, but he has always made cheese, since he was 18 to be precise, and now he is 53 years old. Cheesemaking begins at 5 every morning, and in addition to Grana Padano he also makes a variety of soft cheeses for the dairy shop. The members of the dairy have always placed great importance on the dairy outlet. Egidio tells us it was opened many years ago and was originally run by the cheesemaker and his wife. The cheese was mainly supplied to the members and was delivered by the milkman returning the empty milk churns to the farmers, with the cheese they had ordered packed with ice inside those churns. There was a credit book to keep a record of the deliveries. As the years went by, the decision was taken to open the shop for direct sales to the public as well, and Egidio was there to manage the whole thing. He has been the accountant here since 1978. He is a key figure and a factotum because on top of the office work and running the dairy shop, he also handled the farmers markets for many years. First they went with stalls, which had to be set up when they got to the market, and portable refrigerated boxes for the cheese. That went on until a few years ago, when the members decided to invest in the business by purchasing a food van. Many other investments have been made over the years, including the biogas plant which harnesses pig waste to produce energy and leads to savings of at least 30% on methane gas; then in 2012 they installed photovoltaic panels on the roofs of all the buildings, which make the dairy energy self-sufficient with a yield of 500kw. There is a strong air of tradition here, and as we chat, Remo and Egidio show us some photos of the opening ceremony, then of the sixtieth anniversary, attended by the representatives of the local authorities and the parish priest celebrating mass. He gave the blessing to the dairy, wishing for them to continue on that path for many years to come. And we too would like to extend the same wish to the Latteria Sociale in Roverbella. Thanks and congratulations!